AzhwAr reminisces about the ways by which emperumAn transforms himself in order to carry out the tasks of dhEvas (celestial entities) who desire other benefits (than emperumAn himself) and feels affectionate towards him. isaindha aravamum veRpum kadalum – if one were to plunge a mountain manthara as the agitator in the ocean and a snake vAsuki as the rope around it and start churning, will these be compatible? They will very well be compatible since manthara is fully fit to be used as the agitator for churning, vAsuki is fully fit to be used as the rope and the ocean is fully fit to be used as the container for the churning process. pasaindhu angu amudhu padaippa – taking these three together, emperumAn churned using his strength, making the ocean water as the refuse and getting nectar out of it. asaindhu kadaindha varuththamO – Is emperumAn feeling troubled since he had to use his divine body in order to churn the ocean? The term asaindhu refers to the effort put in by emperumAn to move his body during churning. kachchi vehkAvil kidandhu irundhu ninRadhuvum angu – is it due to the tiredness of having had to churn that emperumAn has taken a reclining posture at thiruvehkA in kAnchIpuram, has taken a sitting posture in the divine abode thiruppAdagam in kAnchIpuram, and has taken a standing posture in the divine abode thiru Uragam? 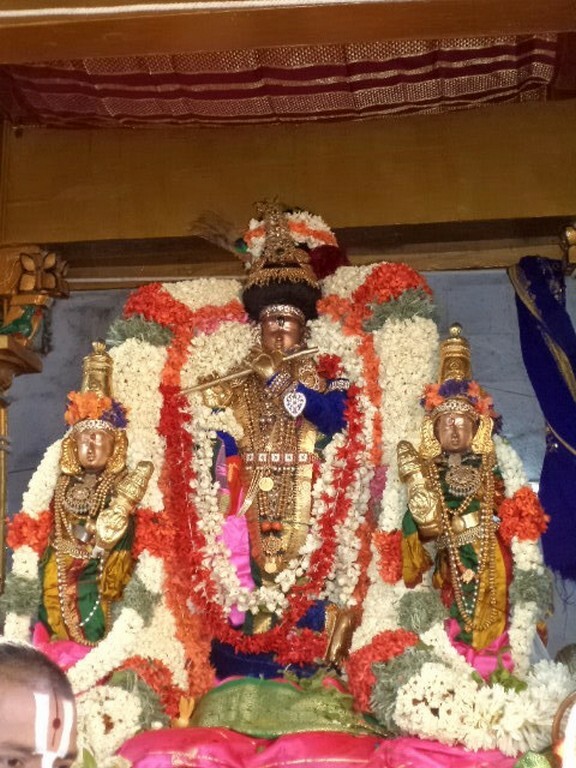 AzhwAr feels fearful due to his affection for emperumAn since he is present in all three poses (of standing, sitting and lying down) in these divine abodes. We will take up the 65th pAsuram next. This entry was posted in iyaRpA, mUnRAm thiruvandhAdhi on May 3, 2018 by T N Krishnan.